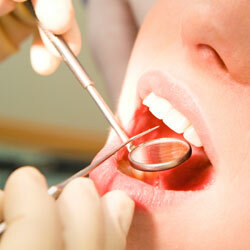 Do you know how important general and preventive dental care is? So important that Dr. Angela Ruff and the rest of our Fayetteville dental team encourage you to come in twice a year for a visit. During your visits, we’ll look for tooth decay and gum disease, the two most common threats to good oral health. Gum disease in particular is dangerous for what it can do to your overall health and wellbeing. It’s been estimated that gum disease affects close to 75% of adults over 35. What’s more, 70% of adult tooth loss can be blamed on untreated periodontal problems. But with regular care from our Fayetteville dental office, we can help you prevent and treat gum disease with a range of general dentistry services. During your appointment, Dr. Ruff will look for common oral health issues and recommend a specific treatment plan tailored to your needs if anything is found. How can you keep your smile clean in between visits? By following a good oral care routine! We tell our Cumberland County patients to brush at least twice a day, floss at least once, and use a good antibacterial or fluoride mouthwash. Following these easy steps will help you enjoy better oral health year-round. Call Ascot Aesthetic Implants and Dentistry to schedule an appointment Dr. Ruff. We’re happy to offer general dental care to patients from Fayetteville, Spring Lake, and Cumberland County.